While the rest of the country at this time of year is still dealing with snow and rain, the lucky ones (You and Me!!!) get to enjoy the beautiful and warm weather that Southern California is known for! 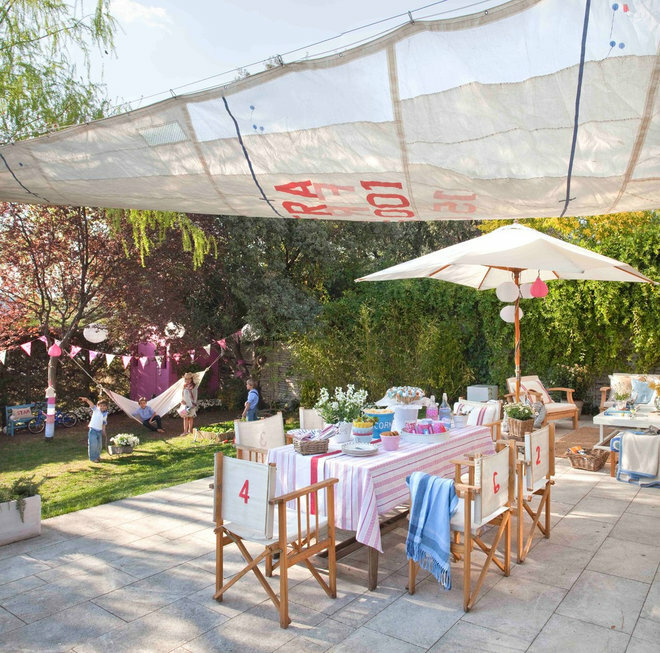 And if you haven’t already, it’s definitely time to spruce up that outdoor space and get it ready for the many gorgeous summer days and nights that are just around the corner. 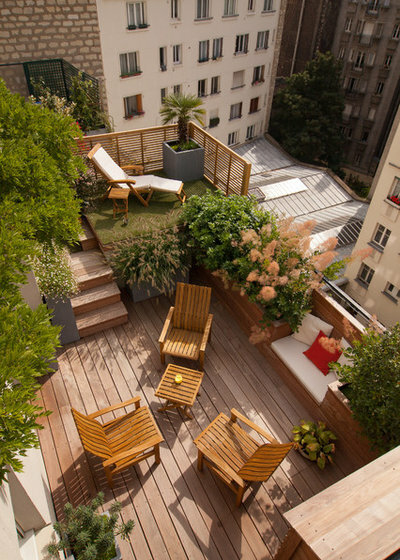 Below is a list of the 10 great ways, as compiled by Houzz.com, to make your outdoor space truly the outdoor LIVING space you’ve always wanted! If you need further help then please contact us HERE! We routinely give our clients recommendations on the best ways to update and maximize your outdoor space (or indoor for that matter!) that will not only provide a lovely area for you to enjoy but also contribute to the overall value of your home! During the warmer months, your outdoor rooms can truly be an extension of your living space if you take the time to outfit them with the comforts of the indoors — think sink-in seats, bar carts and mood lighting. 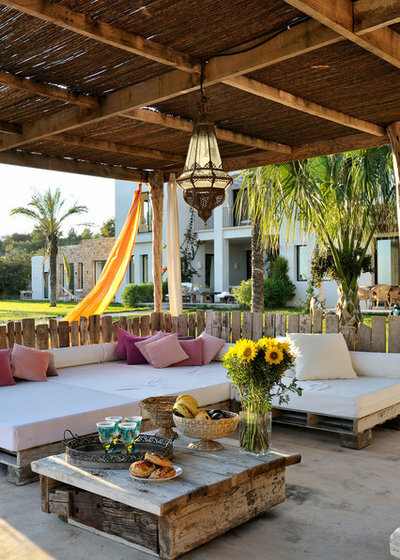 Pull up a chair (or pouf, hammock or daybed) and stay awhile. 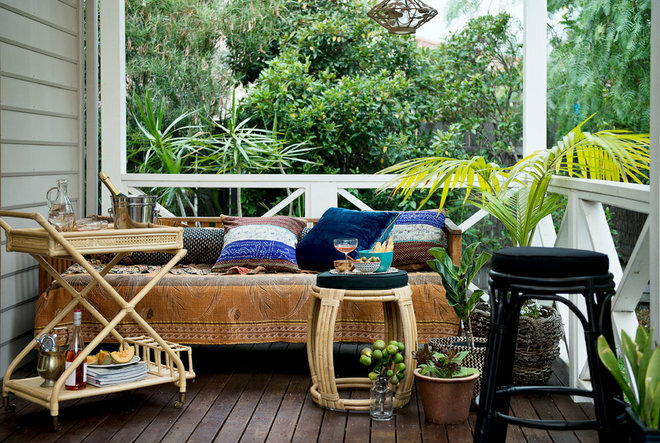 These 10 outdoor spaces are packed with ideas for making your porch, patio or deck the place to be. 1. Flexible seating for a crowd. Bench seating with built-in storage keeps cushions protected from the elements yet ready to grab when you need them. A selection of thicker floor cushions can be used as extra seats to accommodate a large group, and a table on casters makes a portable surface for setting down drinks and snacks. 2. Party-ready patio. A large shade sail covering the patio provides more coverage than an umbrella alone. An extension table and folding director’s chairs can handle a crowd, but can easily be scaled back when it’s just family. Dress up for a party with a colorful tablecloth and lanterns, and personalize plain canvas chairs with stenciled-on numbers. 3. Daybed hideaway. 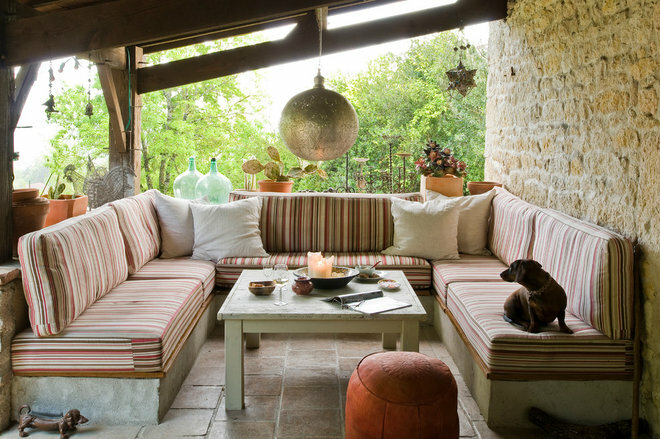 Give a daybed on the porch an eclectic look with layers of rich textiles and pillows. For the ultimate in outdoor comforts, pull up a bar cart with drink fixings and a bamboo stool on which to set your beverage and book. Leafy potted palms add to the lush, tropical feel. 4. Hammocks for everyone. If one hammock is good, three are even better! Use a mix of larger hammocks (good for napping) and chair-style hammocks to maximize the hangout options. 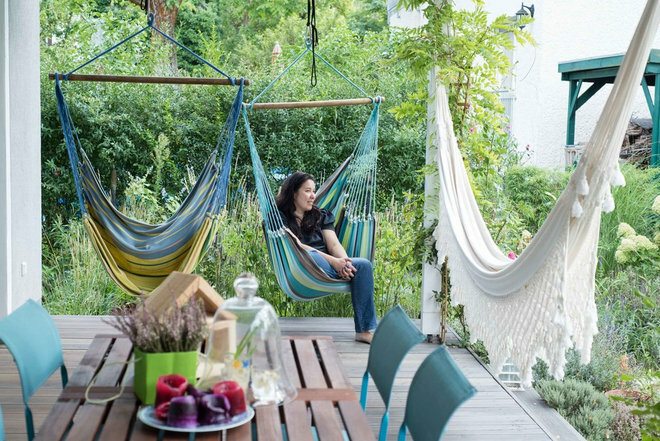 Bonus: Hammocks have a very small footprint when not in use, making them the perfect choice for a compact outdoor room. 5. Cozy outdoor lounge. Built-in benches topped with thick cushions, a sturdy coffee table and an eye-catching Moroccan-style pendant light make for an outdoor space you’ll want to settle into and not leave. Extend seating possibilities with a pouf or two, and don’t forget the candles for even more evening ambiance. 6. Solo escape. A postage-stamp-size balcony doesn’t have to be a setback — think of it asan opportunity to create a getaway perfectly sized for one. 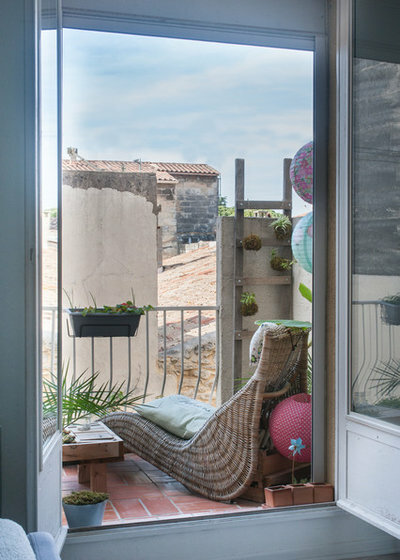 A curvy lounge chair, a few potted plants and a string of colorful lanterns transform this small space into a nook you’ll look forward to escaping to. 7. Urban green. Missing the green grass? Bring it to where you are with a cheeky fake-grass rug and plenty of big potted plants, shrubs and even trees. With greenery up high and down low, this little city balcony feels downright verdant. Solar stake lights placed in a potted tree glow in the evening, making this a lovely place to unwind after work. 8. Pallet perfection. 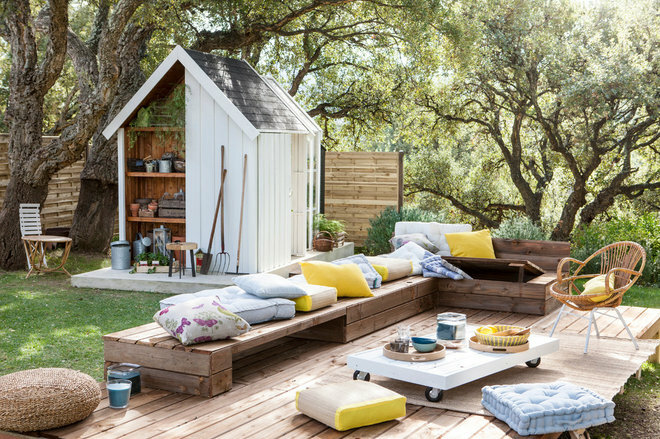 Recycled wooden pallets are transformed into a spacious outdoor sectional when topped with thick cushions and bolsters. When you’re entertaining outdoors, don’t forget the flowers — a vase of fresh blooms can make your outdoor room even more inviting! 9. Sanctuary in the city. 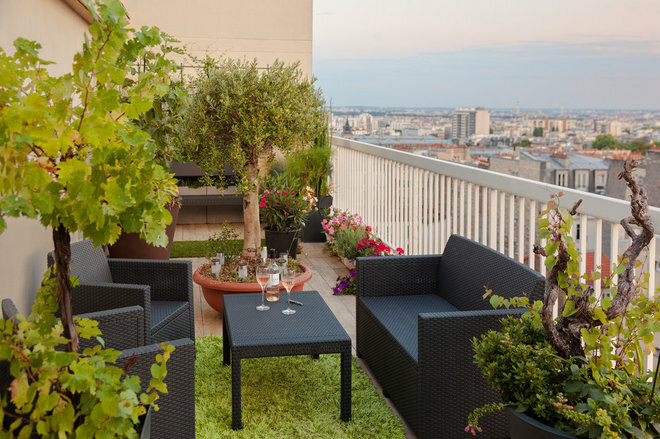 Slow down and savor the little things— with places to gather, or relax on your own, this rooftop deck manages to feel secluded even in the midst of tall buildings. Multiple levels and smart landscaping help carve out private-feeling areas, while the generous use of natural wood makes for a relaxing atmosphere. 10. Nighttime magic. Sometimes the right lighting makes all the difference in the world. 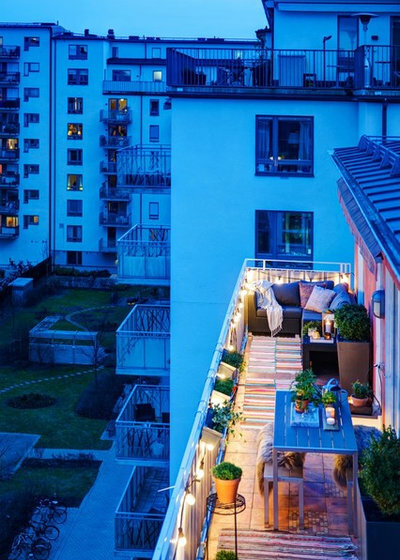 If you have a small outdoor space, lighting the edges will help the area seem more spacious. Smaller accent lighting in the form of lanterns or candles brings the focus to tables and seating areas, and illuminates faces.